Aaliyah reached the top 10 of the pop singles chart with her very first single when only 15. Originally a protege of R. Kelly, she became even more successful in her collaborations with Timbaland and Missy Elliott. Her posthumous releases show just how strong her talent was up until an untimely death in a plane crash at age 22. These are 10 of the best recordings of Aaliyah's far too short career. Aaliyah's "Try Again" was her only single to go to #1 on the Billboard Hot 100. It became the first song to hit #1 based solely on radio airplay. "Try Again" was recorded for the soundtrack to the film Romeo Must Die which starred Aaliyah in her first major movie role. The song was produced by Timbaland and was nominated for a Grammy Award for Best Female R&B Vocal Performance. Timbaland's opening rap in the song is taken from "I Know You Got Soul" by rap legends Eric B. & Rakim. "Try Again" included influences from Detroit techno and acid house music. It became one of Aaliyah's most celebrated songs. In addition to earning a Grammy Award, Aaliyah also won two MTV Video Music Awards for "Try Again" including Best Female Video. Rolling Stone listed the song as one of the 100 best of the decade and the Village Voice counted it as one of the top 10 songs of the year in 2000. Aaliyah recorded "Are You That Somebody" for the soundtrack to the film Dr. Doolittle. It was produced by Timbaland and brought them both strong critical acclaim. "Are You That Somebody" was on the charts when Billboard changed their policy to allow airplay only singles on the Hot 100. However, the single was already headed down so only reached #21 on that chart. It was a #4 pop radio airplay hit. "Are You That Somebody" received Aaliyah's first Grammy Award nomination for Best Female R&B Vocal Performance. One of the most distinctive sounds used in Timbaland's dense production is a sample of a baby cooing. The clip has been used in multiple recordings and dates to the 1966 song "Countdown at 6" by electronic music pioneers Perrey and Kingsley. Rolling Stone counted "Are You That Somebody" as one of the top 50 songs of the 1990s and Village Voice ranked it as one of the top 5 singles of 1998. Missy Elliott and Timbaland co-wrote "If Your Girl Only Knew" and Timbaland received the production credit. Aaliyah was only 17 when the song was released as the first single from her One In a Million album. It was the first record to showcase the talent of all three collaborators, Aaliyah, Missy Elliott, and Timbaland. "If Your Girl Only Knew" hit #1 on the R&B singles chart and went to #11 on the Billboard Hot 100. Missy Elliott and Timbaland have cameo appearances in the music video along with Lil' Kim and Ginuwine. It stars Aaliyah in her trademark sunglasses. The album One In a Million was a critical and commercial success. It peaked at #18 on the overall Billboard album chart, but reached #2 on the R&B chart and was ultimately certified double platinum with total sales now over three million. Rolling Stone ranked it as one of the top 100 albums of the 1990s. Multiple writers have identified it as one of the most influential albums of the 1990s in the hip hop community. "Miss You" was a song left behind when Aaliyah died tragically at the age of 22 in a plane crash in 2001. Her label Blackground set it aside as not likely to be a "smash record." The poignant lyrics fit the feelings of many of Aaliyah's personal and professional connections who were still in shock over her death. Producer Teddy Bishop finished the song and it was released as a single from the posthumous compilation album I Care 4 U. 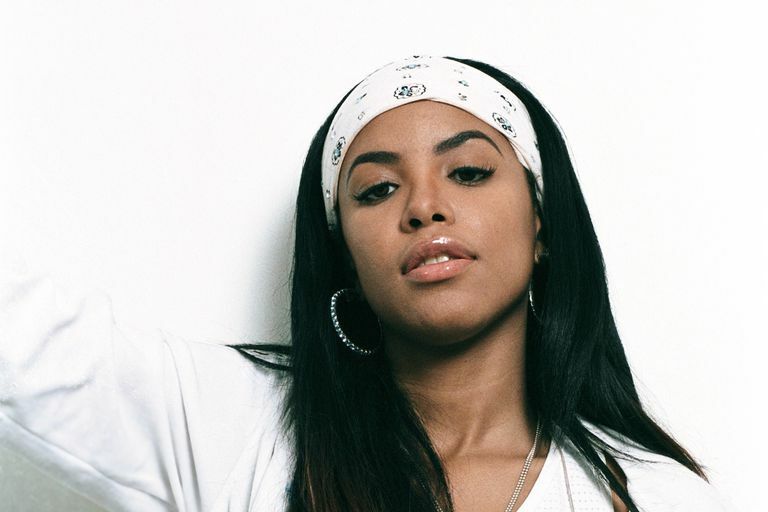 The understated production showcases Aaliyah's vocals. The accompanying music video features clips from her earlier videos as well as cameo tributes from a wide range of her music friends and colleagues. It earned an MTV Video Music Awards nomination for Best R&B Video. "Miss You" reached #3 on the Billboard Hot 100. "Age Ain't Nothing But a Number" is the title single from Aaliyah's debut album. It was produced by R. Kelly and generated some raised eyebrows due to its lyrics about dating someone older. Aaliyah was only 15 when the song was released. She sings a line from Bobby Caldwell's 1978 top 10 hit "What You Won't Do For Love" multiple times in "Age Ain't Nothing But a Number." The song was a top 40 hit on the R&B chart and broke into the Billboard Hot 100 peaking at #75. The album of the same name peaked at #18 on the overall album chart. The accompanying music video was directed by Millicent Shelton, known for work with Mary J. Blige and R. Kelly. It includes cameo appearances by rappers Proof and Bizarre. "We Need a Resolution" was the lead single from Aaliyah's self-titled third album. It features one of the most sophisticated and complex of Timbaland's productions for Aaliyah. Detailing a relationship with difficulties, lyrical snippets like, "Am I supposed to change, are you supposed to change," and "We need a resolution, we have so much confusion" weave with a hypnotic clarinet sample by John Ottman. Among the studio work Timbaland performed was transforming the clarinet sample from 10/8 time to 4/4. Timbaland also used backward tracks for closing impact. The mix is intoxicating. "We Need a Resolution," with its complex, futuristic feel, was only a minor commercial success. It peaked at #59 on the Billboard Hot 100 and climbed to #15 on the R&B singles chart. "At Your Best (You Are Love)" was originally recorded by the Isley Brothers in 1976 on their album Harvest For the World. They dedicated the song to their mother. Aaliyah recorded it for her debut album Age Ain't Nothing But a Number. It became a hit in a version remixed by R. Kelly featuring a notable clip of R. Kelly saying, "1-2, check up, baby, lemme know what's up." "At Your Best (You Are Love)" became Aaliyah's second top 10 pop hit peaking at #6. Drake sampled Aaliyah's recording of "At Your Best (You Are Love)" in his 2010 song "Unforgettable." Hip hop artist Frank Ocean released a cover of the song in 2015 as a tribute to Aaliyah on what would have been her 36th birthday. "The One I Gave My Heart To" was the sixth and final single from Aaliyah's album One In a Million. It is a ballad written by superstar songwriter Diane Warren. As such, the song is a departure into more overtly pop territory than Aaliyah's other hit singles. "The One I Gave My Heart To" peaked at #9 on the Billboard Hot 100 and was certified gold for sales. It reached the top 10 on the R&B chart as well and crossed over into the dance music top 20. Diane Warren told Vibe magazine about working with Aaliyah saying, "She could go where the Whitneys went. She wailed on that single I wrote for her. I write songs that challenge singers, and she rose to the occasion." The recording was acclaimed as one of the most powerful vocals of Aaliyah's career. "Back and Forth" became Aaliyah's first hit single when she was only 15. Produced by R. Kelly, it is a simple song about a teenager looking forward to the weekend, but it also contains strong sexual innuendo. "Back and Forth" reached #5 on the Billboard Hot 100, topped the R&B chart and introduced a formidable new talent. The accompanying music video features Aaliyah and R. Kelly performing together, and it includes Aaliyah's real life high school friends from Detroit. "I Care 4 U" was the fourth single from Aaliyah's self-titled third album. It is a deeply soulful song co-written by Missy Elliott and Timbaland. The song climbed to #16 on the Billboard Hot 100 and reached #3 on the R&B chart. The song was originally recorded for the album One In a Million, but it was completed after the album was ready to hit stores. Instead, the song was saved for Aaliyah's next album. "I Care 4 U" was not officially released as a single until after the compilation album of the same name was released in December 2002. "I Care 4 U" was released as a twelve-inch promotional single in April 2013 over eighteen months after Aaliyah's death. The song was approximately seven years old at that point but still had a significant impact at pop and R&B radio. Ten Reasons Why Aaliyah Was "The Princess of R&B"